I was never taught anything about money growing up. We were poor and mostly lived on government assistance, and I never knew how to budget. I’ve recently begun learning and this book has helped me to look at money from a biblical perspective. I look forward to having my husband read it too, and to start giving! — S.A.
Last Sunday they were handing out free copies of your book Managing God's Money at my church. I took the book and have now read it from cover-to-cover and I can say that it hit home with me the same way a brick through my window would–it got my attention! The book is well written and completely understandable for everyone. — C. C.
As one who has worked in the area of financial coaching and teaching for nearly 20 years I found this book to be highly informative, sound, and very helpful. I encourage everyone to read this book and apply it to their lives. — D. T.
Rarely has a book made me feel so convicted, or made me want to change my mindset as much as this one! I never even thought I had a problem with how I view or handle money, but Randy Alcorn has some eye-opening observations to make. I'm definitely putting some of his more in-depth works on my "to read" list. I need to make a major turnaround, stat. — J.
I just taught a six-week college course entitled "The Christian and Money" and I found this book Managing God's Money very helpful. I appreciated the emphasis on going to God's Word for the answers. — K.M. This is a very thorough, biblical insight in how best to handle the money God entrusts his children with. Randy doesn’t shy away from difficult gray areas, but does it in a beautifully biblical way. All questions I could think of are covered and well-answered in this book. It is a challenging yet very good read. — B. This book should be required reading for every Christian and church member. I can testify that it works. I’ve been a guy always challenged with money, but since I’ve started tithing and giving I’ve never had another worry about having enough money to meet my needs. – J. W.
What a perfect book... great small paperback size and great low price! The table of contents is especially helpful in Q&A format so it's easy to find just what you're looking for. This is the perfect resource for young married couples looking to start their financial life together on solid ground. — B. A. 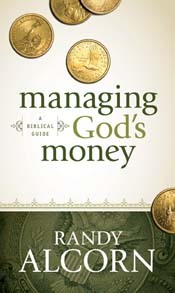 Learn more about and purchase Managing God's Money. Finally, a book on money that will not break the bank!!! Alcorn has compiled an excellent topical guide to finances that should be on every pastor's shelf and in the home of every Christian family looking to honor God with their money.